Meet Blue Coat Chef Stephanie. 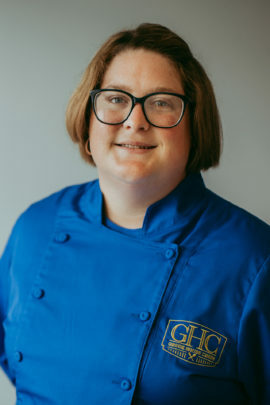 Stephanie received her formal chef training in Saint Louis, Missouri at L’Ecole Culinaire, but her inspiration for being a chef comes from her grandmother. Her grandmother was also an incredible chef, who taught Stephanie many, many things in the kitchen growing up. Desserts are one of Stephanie’s favorite foods to cook and enjoy, with pecan pie being her absolute favorite! Like many other chefs who work for Greek House Chefs, Stephanie loves the extra time she has to spend with her son. She says that if it weren’t for GHC she wouldn’t have that luxury of having a great work/life balance. Stephanie is an extremely hardworking and passionate chef and it shows in her food! She loves getting to share her passion of food with the girls in her chapter house and seeing how much they enjoy her food every day.